Cliff diving is an exciting sport that has been enjoyed for centuries by both professionals and amateurs. In the 1700s, Hawaiian warriors were required to jump off the cliffs at Kaunolu to display their courage to King Kahekili, the King of Maui. Landing in the water as straight as possible without making a large splash was considered a commendable feat. Today, cliff diving is a recognized sport held in exotic locations around the world. With high-profile competitions being organized by the World High Diving Federation and Red Bull World Series each year, the popularity of cliff diving for both professionals and amateurs is only expected to grow. There are five different cliff diving platforms at Ariel’s Point. Their exact distances from the water varies with the incoming and outgoing ocean tides, but the highest platform is 13 to 15 meters above the water. The lower platforms are 7-meters, 6-meters, 5-meters, and 3-meters high. 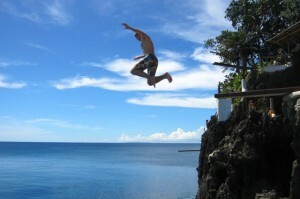 Guests who wish to enter the water without cliff diving can do so by walking to a bamboo dock near the entrance to Ariel’s Point or by climbing down a ladder located near the 3-meter platform. While cliff diving is a popular sport, please recognize that cliff diving is not for everyone. Like many outdoor adventure activities such as kite surfing, scuba diving, parasailing, wakeboarding, banana boating, and horseback riding, cliff diving has risks and can result in bodily harm. Cliff diving is not recommended for individuals who have a history of health problems, are taking medication, recently underwent surgery, are afraid of heights, are in poor physical condition, or are uncomfortable with full contact sports. Additionally, pregnant women and young children are not permitted to cliff dive. All Ariel’s Point guests are required to read and sign a liability waiver during pre-departure registration. An information and safety briefing is conducted prior to each trip, and lifeguards are stationed at Ariel’s Point to monitor and assist people who choose to cliff dive. Additionally, there are other outdoor activities for non-cliff diving guests to enjoy during their visit to Ariel’s Point. If you have any additional questions or concerns, please let us know! Now Open! Ariel’s Point is an eco-adventure destination where guests can cliff dive, kayak, paddleboard, and snorkel in an unspoiled tropical paradise. Daytrips are offered 7 days a week, depart each morning from the Boracay Beach Club in Station 1, and return to Boracay at 5:00 PM. The daytrip package includes a boat cruise, a BBQ buffet lunch, afternoon snacks, unlimited beverages (including beer and mixed drinks), cliff diving, paddling, snorkeling, and a souvenir bracelet. Tickets can be purchased online or in-person at the Boracay Beach Club (behind Club Paraw) in Station 1.